Sen. John Barrasso (R., Wyo.) is asking the Department of Justice for documents related to the FBI's investigation into the Russia-Uranium One deal, which found evidence of Russian officials engaging in bribery, kickbacks, and millions of dollars flowing to the Clinton Foundation before the deal was approved by the U.S. government. Barrasso has been raising concerns about the deal, which ultimately gave Russia control of 20 percent of the U.S. uranium supply, since 2010. The Obama administration ignored the senator's requests for documents after the New York Times reported on Bill Clinton's six-figure speaking fees in Moscow to a Kremlin-linked investment bank, and Uranium One donated $2.35 million to the Clinton Foundation while the deal was awaiting approval from the State Department, then run by his wife, Hillary Clinton. Barrasso is now asking the Trump administration for answers, after the Hill reported that the FBI had evidence before the deal was approved of "bribery, kickbacks, extortion, and money laundering designed to grow Vladimir Putin's atomic energy business inside the United States." The FBI had documents and an eyewitness account detailing how "Russian nuclear officials had routed millions of dollars to the U.S. designed to benefit former President Bill Clinton's charitable foundation during the time Secretary of State Hillary Clinton served on a government body that provided a favorable decision to Moscow." "I am contacting you to express my deep concern with recent revelations that the Obama administration approved a 2010 sale of American uranium reserves to the Russian government despite evidence that Russian nuclear energy officials engaged in corrupt conduct on U.S. soil," Barrasso said. "I am extremely disheartened and disturbed by recent reports indicating that CFIUS approved the Russia-Uranium One deal despite the fact that the Department of Justice, a member of CFIUS, possessed evidence of corruption by Russian nuclear energy officials in the United States," said the senator. "A full account of whether the Department adequately disclosed this evidence to CFIUS is critical to provide transparency to Congress and the American public." Barrasso referenced letters he sent to former President Barack Obama in December 2010, and then-Secretary of the Treasury Jacob Lew in May 2015 raising concerns about the national security implications of Russia owning 20 percent of America's uranium supply. "This transaction would give the Russian government control over a sizable portion of America's uranium production capacity," Barrasso wrote to Obama. "Equally alarming, this sale gives ARMZ [Uranium Holding Co.] a significant stake in uranium mines in Kazakhstan." "As you know, Russia has a disturbing record of supporting nuclear programs in countries that are openly hostile to the United States," Barrasso said. "Russia has directly aided Iran's nuclear development and agreed on October 15, 2010 to help develop Venezuela's nuclear program. This record is at great odds with our own national security." Barrasso received a response from the Nuclear Regulatory Commission in March 2011, which defended the deal since it did not also give Uranium One a license to export uranium. However, the New York Times reported that even without an export license, Uranium One had been exporting yellowcake to Canada by using a proxy transport company that was licensed. 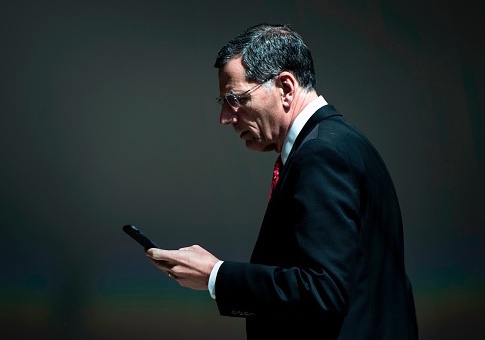 Barrasso's letter to the Treasury Department in 2015 asked for copies of any letters and emails from any agency that participated in the CFIUS review and expressed any concerns regarding the national security implications of the deal. He never received a response. Barrasso is now asking Sessions for all documents related the FBI investigation, and names and positions of individuals within the department who were responsible for what information was shared with CFIUS. He gave a deadline of Dec. 1. The Hill reported that the FBI had collected substantial evidence dating back to 2009, before the Uranium One deal was approved in October 2010. The Hill could not determine whether the Justice Department or FBI ever shared its investigation with members of CFIUS, which included Secretary Clinton and then-attorney general Eric Holder. On Thursday, President Donald Trump discussed the latest revelations of the uranium deal and FBI investigation. He said the scandal was the "real Russia story," rather than investigation into Russian interference in the 2016 presidential election. "If the mainstream media would cover the uranium scandal and that Russia has 20 percent of the uranium, for whatever reason, and a lot of people understand what those reasons may be, I think that's your Russia story," Trump said. "That's your real Russia story, not a story where they talk about collusion and there was none." This entry was posted in Issues and tagged Bill Clinton, Clinton Foundation, Hillary Clinton, John Barrasso, Russia, Trump Administration. Bookmark the permalink.